After a dinner for the crew of the TV series I'm shooting we came out of the restaurant and realised that we had a fantastic collection of Copenhagen bikes. The chap on his 'flavour of the month' fixie had left but add it to these bikes above. Me and my Velorbis Scrap Deluxe. Needless to say, I was the only one who actually noticed the fine variety of Copenhagen bicycles gathered in one place. 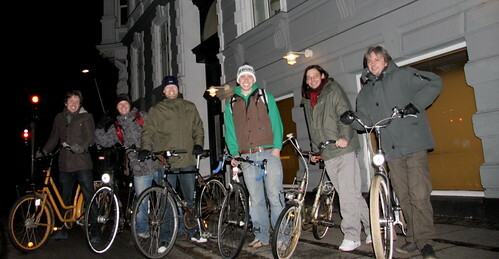 Copenhageners don't notice bikes or have long conversations about them. You'll get a "cool bike" once in a while - if your bike is cool, that is - but rarely more than that. The goofy smiles in the photo are the result of two bottles of snaps [schapps], good food and laughs. We were off to a pub, after which all digital recording ceased.